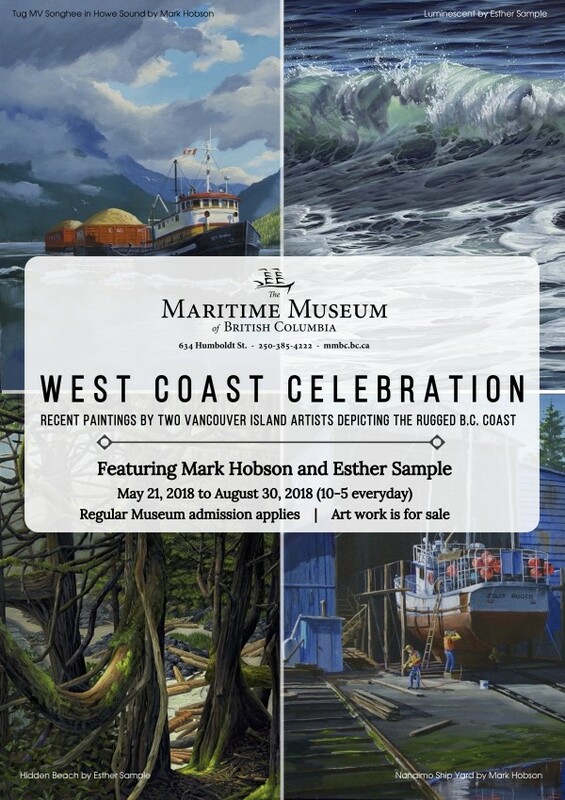 Past Events - Events & Workshops with Mark Hobson - Mark Hobson • Coastline Art Inc.
West Coast Celebration - Maritime Museum, Victoria, B.C. Three-day acrylic painting workshop looking at capturing the west coast sunset over wet sandy beaches. Participants responsible for all of their own art supplies. Register by contacting The Mark Hobson Gallery. Bursaries are available for Pacific Rim locals by application to the Tofino Arts Council. Mark will be demonstrating how he creates his vivid and detailed artworks at ArtSplash. March 11, 1 - 4 pm. Mark's demonstration is free, but a donation to the exhibition is encouraged. ArtSplash is an annual art show featuring Pacific Rim Arts Society member artists of all mediums. Black Rock Oceanfront Resort - 596 Marine Drive, Ucluelet B.C. Inspired by a few trips to Ireland in recent years, Mark has completed a collection of landscapes and village images in acrylic, oil and watercolour, that he started on location. He travelled with fellow artists Murray Phillips and Gaye Adams, who will also be exhibiting at the show. If you're in the lower Vancouver Island area be sure to get along to see Mark's work. He will be in attendance hosting a demonstration on the opening Saturday and Sunday. Times to be confirmed. Venue: Peninsula Gallery #100 - 2506 Beacon Avenue, Sidney, Canada. Come see Mark in action at ArtSplash!, Pacific Rim Arts Society's Annual Spring Art Show. The work of many talented west coast artists will be on display. This event takes place during the Pacific Rim Whale Festival. This workshop is now full however you may register to be on the waiting list by contacting the Mark Hobson Gallery. The inclusion of tide pools, ponds or rivers to a landscape scene can have an enormous impact on the feeling of the piece. Calm water can have a relaxing mood while a wind-swept ocean or river can impart tension and drama. This three and a half day workshop is designed to give landscape painters a background in the way water works. Using an example of a west coast scene of a tide pool with rough seas in the background the class will paint along with the instructor for most of the class. There will be a variety of water surfaces in the scene and the goal will be to understand how each of these works, from turbulent waves to calm pools where the bottom can be seen through the reflections. There will be lots of reference slides and pictures to borrow to work from. The painting techniques demonstrated will be most applicable to acrylic painters. PAINTING WATER in acrylic is best suited for experienced beginner to intermediate students and is designed to give landscape painters a background in the way water works. The addition of ponds or rivers to a landscape scene can have an enormous impact on the feeling of the piece. Calm water can have a relaxing mood while a wind-swept lake or river can impart tension and drama. The reason a surface looks wet, be it a log, a road or a pond is almost entirely due to the reflections that the viewer sees. Painting reflections is therefore a large part of this workshop's theme. Using slides of the real world we will explore the change that reflections undergo from a glassy calm morning to white capped waves on a windy day. Using an example of a shallow alpine lake the class will paint along with the instructor for the first portion of the class. The goal will be to understand the transition from background reflections to the foreground, where the water appears totally transparent. Dates: Thursday 22 to Sunday 25, October 2015. Contact the Mark Hobson Gallery for more information or to register. Mountains and Mist with Acrylics. This workshop will be most helpful to acrylic painters who would like to perfect softening edges or to create smooth blended backgrounds in landscape paintings. Acrylics have many wonderful qualities but they dry fast and often go a touch darker when they dry which can cause all kinds of issues when painting skies and misty scenes. Learn to blend colours to form very realistic atmospheric conditions. Using mountain scenes and working with several techniques, the workshop will will incorporate painting morning mist rising among peaks. The instruction is primarily a step by step approach with most of the class following through the same steps. Along the journey there is always room for conversation on composition and the various ways of incorporating light into your work. Dates: Saturday 5 to Monday 7, October 2013. For more information visit Leading Edge Art Workshops or call Louise 403 233 7389. Following the West Fine Art Show in Langley, the show will then move to Vancouver. Trev Deeley is a long time supporter of the arts and Mark is looking forward to this new venue. If you're in the lower mainland area be sure to get along to see Mark's latest works. Mark will be returning to the West Fine Art Show in 2014 at its new location, the Thunderbird Show Park. This fabulous group show features many talented artists and part proceeds from all sales at this show go to Langley Hospice Society. Mark's artwork, Trumpeter Swans: Preening Time, is one of many artist's work on display at the Artist for Conservation Annual Festival at Grouse Mountain, North Vancouver from September 27 to October 6th, 2013. Click here for detailed information. Mark's Presence at the Festival. 2:30PM – 4:00PM Live demos by several artists including Mark. The Artists For Conservation Festival at Grouse Mountain, North Vancouver, BC from September 27 to October 6th, 2013 for one of the most highly anticipated events in the nature-inspired art field - AFC's 6th annual juried art exhibit and sale, The Art of Conservation 2012! The AFC exhibit is the world's top conservation-themed art exhibit and sale. Visit the exhibit for an opportunity to buy original paintings and sculptures. The exhibit will feature over 80 original artworks for sale by over 70 leading nature and wildlife artists from around the world. Enjoy worldwide artistic excellence, learn about conservation issues, and directly support conservation work through the purchase of artwork. Indian Springs Land and Cattle Company, Surrey B.C. Mark will be returning to the West Fine Art Show in 2013, a fabulous show in a beautiful barn and ranch surroundings. Part proceeds from all sales at this show go to Langley Hospice Society. If you're in the lower mainland area be sure to get along to see Mark's latest works and meet some other fantastic artists too. This will be Mark's first time exhibiting at the West is Best Fine Art Show. CANCELLED: Due to a scheduling clash Mark will not be able to attend this event! Please still get along to it if you are in the area. It is a beautiful outdoor show with many amazing artists. First Avenue in Ladysmith is transformed into a street filled with art, food, entertainment and fun. Mark will be exhibiting his paintings along with a great group of artists, creators of paintings, jewellery, pottery, carving. metal pieces, photography, painted glassware, and hand woven items. Mark has been exhibiting at Nautical Days for many years. Come along and enjoy this great community weekend and see Mark's latest works. Mark will be in attendance all weekend. To celebrate the 30th Anniversary of Mark's arrival to the west coast and to officially open the recently expanded gallery we are offering 20% off all items! Mark will be in too, so come in and say hello! Cruise through the inlets and waterways of the Great Bear Rainforest aboard the Columbia III. Guided by the knowledgable crew this trip takes you to some of the most remarkable places, where you will be able to paint with the guidance of Mark and Gaye Adams. Gaye will be painting in oils, Mark in acrylics - but between the two painters, coaching is available in whatever medium you choose to work in. This tour departs from and returns to Bella Bella. Getting to and from the departure point is additional to the fee and is the guests responsibility to organise. Trips are all inclusive from the point of departure apart from your own art supplies. Full information and registration through Mothership Adventures. Using a variety of references the workshop will work through wet on wet techniques to create exciting skies and reflections in wet sand. Techniques to add rocky out crops and spruce-covered islands, which recreate authentic dramatic landscapes, will also be covered. Skill level is intermediate but both beginners and experienced painters are welcome. Watercolour paper, brushes and paint supplies must be provided by you. A full list will be sent once bookings are confirmed. Financial assistance may be available for Tofino and Ucluelet residents through the Tofino Arts Council. For more information or to book a spot call 250 725 4280 or email Tofino Arts Council. Places are limited. 4-Day Plein Air Workshop in Acrylics or Oils. The focus will be on working with moving water, lighting and reflections. The four days will be spent outdoors as much as possible, including the use of a special sheltered sandy beach near the Wickaninnish Inn. Canvases, brushes and paint supplies must be provided by you. A full supplies list will be sent once bookings are confirmed. Three-day nature painting workshop looking at landscape techniques to achieve the softer look of the west coast. For more information, visit Pacific Brant Carving and Art Show. Join Mark Hobson and Gaye Adams for a 10 day painting workshop on the island of Korcula, Croatia. Acrylic & Watercolour with Mark or Oil & Pastels with Gaye. You can work with one or both artists throughout the workshop. Fee includes your accommodation, meals and island transport incl. pick up/drop off at Dubrovnik Airport. All you need is your own artwork supplies and your flight to Croatia. Please only book your flight after you have confirmed your place in the workshop. Visit Slikamilina Tours for tour information. Mark will be exhibiting with a great group of painters and carvers at The Pacific Brant Carving and Art Show. On the Saturday evening is a “Meet and Greet” the artists event from 7:00 pm to 9:30 pm and will include a silent and live auction. Refreshments will be available during the evening event. Visit the the Pacific Brant Carving and Art Show website for full details. With their quick drying time and slight shift in colour as they dry, acrylics can pose some frustrating challenges when trying to create softy misty scenes. The theme of this workshop is to share techniques in soft blending of acrylics to create misty west coast scenes. Cost: 2 Day Workshop + Friday Night Demo includes lunch & refreshments - $300.00 includes HST. Friday Night Demo Only: $30.00 includes HST. Mary Winspear Centre, Sidney B.C. General Admission to the show is $7. Refreshments will be available during the evening event. Mark will be exhibiting with a great group of painters and carvers at The Pacific Brant Carving and Art Show. The show is open on Saturday, April 14 and Sunday, April 15 from 10 a.m. until 5 p.m. in the Bodine Hall at the Mary Winspear Centre off Highway 17 at the entrance to Sidney. On the Saturday evening is a “Meet and Greet” the artists event from 7pm to 9:30pm and will include a silent and live auction. Mark will give a three-day painting workshop on painting wildlife with acrylics. Tuesday 10, Wednesday 11 and Thursday 12 of April, 2012. Artists at all levels are welcome - maximum 16 students. Visit the the Pacific Brant Carving and Art Show website for full details or to register. This show has been cancelled due to the Mark Hobson Gallery now open in Tofino. You can visit the gallery throughout the year. Mark's only solo show for 2013 in the beautiful Salal Room at the Wickaninnish Inn. A great chance to catch up with Mark in a relaxed and gorgeous setting. The Annual Island Arts Expo will be held November Nov 2nd & 3rd at the Lighthouse Community Centre in Qualicum Bay, BC. An Island Arts Magazine event, this extravaganza features over 20 Canadian West Coast artists. Mark will be a guest speaker this year. For opening times, as well as the date and time of Mark's talk please check islandartsexpo.ca closer to the event. Admission is by donation of cash or non perishable food, which all go to the local food bank. The resulting works, combined with prose and poetry, have been published as an art book entitled Canada’s Raincoast at Risk: Art for an Oil-Free Coast. The art work, donated by the artists, will become part of a traveling art show to raise public awareness about why this spectacular coast needs to be kept oil-free. Dates have now been released for the shows including the book release and the film. Click here to order books online. Grand Opening: Tuesday, Nov. 27th, 2012. 7:30pm – 9:30pm. (Doors open at 7:00pm). To book your ticket to this free event please click here. Art Exhibition: Wednesday, Nov. 28th to Sunday, Dec. 2nd, 2012. 1398 Cartwright Street, Granville Island, Vancouver, B.C. Opening Night: Tuesday, Dec. 4th, 2012. 7:30pm – 10:00pm. (Doors open at 7:00pm). Art Exhibition: Wednesday, Dec. 5th to Sunday, Dec. 9th, 2012. 720 Douglas Street (behind the Empress Hotel), Victoria, B.C. Opening Night: Tuesday, Dec. 11th, 2012. 7:30pm - 9:30pm. Art Exhibition: Wednesday, Dec. 12th to Sunday, Dec. 16th, 2012. 100 Jackson Avenue, Ganges, Salt Spring Island, B.C. Opening Night: Thursday, Dec. 20th, 2012. 7:00 - 9:30pm. 45 minute presentation starts in the Shaw Theatre in the Vancouver Island Conference Centre on the corner of Gordon and Commercial Street followed by a 2-minute walk to the Nanaimo Art Gallery. Art Exhibition: Friday, Dec. 21st, 2012 to Saturday, Jan. 5th 2013. 150 Commercial Street, Nanaimo, B.C.